Bella Gypsy Designs: Wowza! Loads of fresh goodies and deals! Happy Tuesday Bella Gypsy Fans! Kiana here! How is your week so far? We have the hustle and bustle of back to school and sports here. So many new things are happening. The biggest one at our house is a new driver. My 15 yr. old driver started Driver's Ed. last week. Tomorrow she takes the written test to get her driver's permit! It seems like just yesterday she was my little princess. Now she is a lot more spunky and sassy. Bella Gypsy has the perfect kit for her. Have you seen the kit called "Brooklyn". It is fun and fresh, complete with a glitter alpha. If you have a roudy little (or big) boy at your house there is a boy version of this kit called "Boston". Both kits are new at Gotta Pixel this week. Grab the bundle and save big! 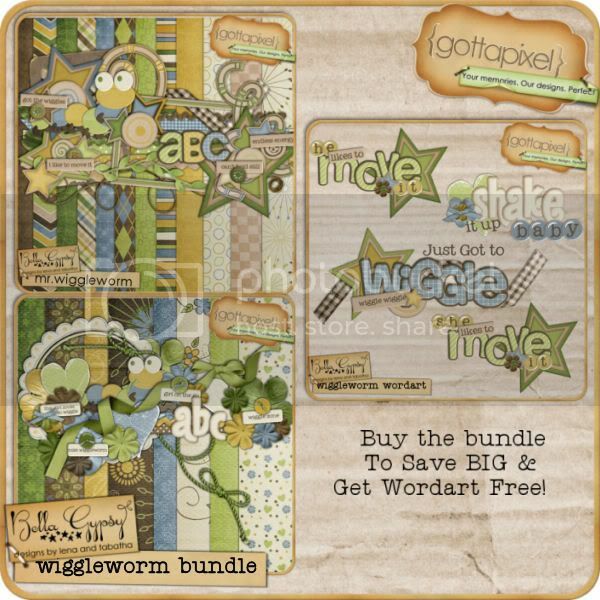 Another fresh face at Gotta Pixel is the kit "Mr. Wiggleworm" and it's more feminine version "Mrs. Wiggleworm". I have a little boy at this house that this kit must have been made for! My toddler will not sit still for anything. He is a busy, busy boy. I am always envious of the mom's who say their toddler will sit and watch a whole movie. I can't imagine! Both of these newbies are on sale for 25% off right now. You can purchase the kits separately or in the value bundle. If you would like some inspiration scroll to the previous post to see the terrific layouts our creative team made! Now on to the deals! In the Gotta Pixel $1 bin this week are some awesome kits! These kits are so fun and unique. First up is a kit called "One Tough Cookie". Love the colors and ellies in this kit. This is another kit that makes me think of my daughter. The next kit is for the macho boys. Rebel Yell is one rockin' kit! The last $1 kit at GP today is called "Rock The Cradle". This kit is for all those cool, hip Mama's to be out there. I love the ellies in this one! Three kickin' kits for $1 each this week! Grab them while you can! Today I have a word art freebie for you. It coordinates with "Brooklyn". It is so adorable! Enjoy! Have a great week everyone! love love those new releases!!! Thanks so much for the cute clustered WA.